How often do you watch silent movies? What do you think of the novel 'I, Fatty'? The silent movie Der Golem produced in 1920, is a masterpiece in film making. Based on a legend in Jewish mysticism, its narrative tells of a clay statue brought to life sa pamamagitan ng Rabbi Loew in a medieval Prague ghetto to defend the Jews from ongoing persecution and attack sa pamamagitan ng the city's rulers. It is found in the rubble of an old synagogue and is used as a servant, initially doing nothing but good. The Golem falls in love, but when his pag-ibig is rejected, he goes on a murderous rampage leaving a trail of destruction. In silent films the dialogue is notably transmitted through gestures, mime and pamagat cards consisting of a written indication of the films plot. In the very beginning, music was only used to entertain the audiences before the movie began, and during the intervals, later, a pianist, organist and sometimes an orchestra would play music to accompany the films, aiding in the creation of mood - music was paramount. In a kamakailan commemoration of St. Andrews araw the Glasgow Film Theatre (GFT) had a araw of films based in Scotland. The theme was called 'Hollywood dreams of Scotland'. The itinerary featured Disney Pixar's Brave, followed sa pamamagitan ng silent film Annie Laurie and ending with cult classic Highlander. But I will focus solely on one film: Annie Laurie. link sa pamamagitan ng Louise Brooks. Essays on her time in Hollywood sa pamamagitan ng the woman herself. link sa pamamagitan ng Jan Wahl and Louise Brooks. Featuring letters written sa pamamagitan ng Miss Brooks to Jan Wahl. This is a starting listahan for anyone interested in learning madami about Rudolph Valentino. * Daydreams (1923) MacFadden Publications, Inc. (New York). A book of mga tula authored sa pamamagitan ng Valentino. This book is not too difficult to locate. * Sogni ad occhi aperti (Day Dreams)- Italian edition translated sa pamamagitan ng Marinella Grosa. (1995) Libreria Petrini Torino (Italy). 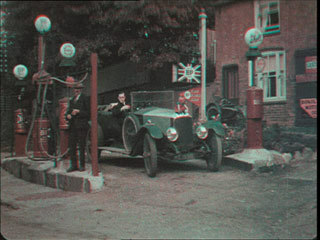 Who made this primitive colour film from the mid 1920s? Have you read any books about silent pelikula and/or actors?